Here we describe how to setup Kaseya Network Monitor with SMSEagle for SMS notifications. Kaseya Network Monitor integration uses Email To SMS plugin (see details: Email To SMS plugin). All configuration related to Emails and SMS messages is done from the Email and SMS settings page. To open the Email and SMS settings page, expand the “Program settings” sub-menu from the “Settings” menu and select “Email & SMS settings”. The Email and SMS settings page will be displayed. The SMTP server is used to send email notifications to users. Enter the address to the SMTP server you want to use. Note that the SMTP server must be able to accept all the email addresses that you are planning to use. 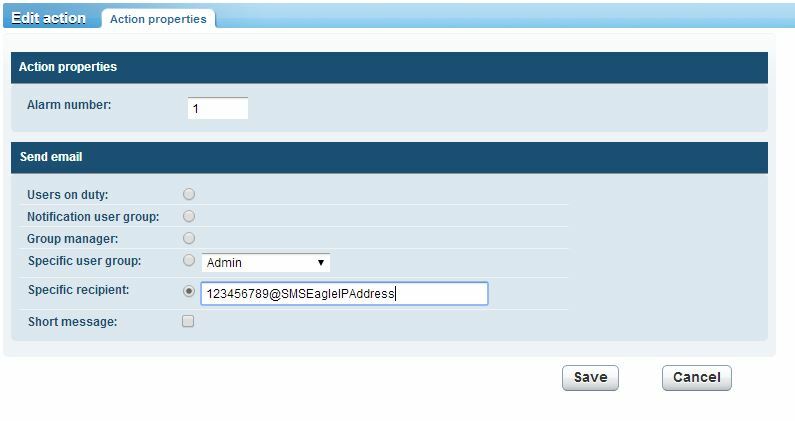 This is the primary SMTP server that will normally be used (you can use SMSEagle as SMTP server). If your SMTP server requires authentication, enter the username and password in these fields. The secondary SMTP server is used when KNM cannot connect the primary SMTP server. If your secondary SMTP server requires authentication, enter the username and password in these fields. Most SMTP servers are configured to only accept incoming emails with a valid return address. Since KNM is unable to receive emails you must specify a return address where emails that could not be delivered will be sent. If needed, a custom HELO identifier can be specified for the SMTP servers here. Operator group – Select an operator group to be the recipient of the SMS message. Operator – Add specific operators as recipients to the message by selecting them from the list and click on the “Select” button. Selected operators – Operators currently selected as recipients are listed here. To remove an operator, select it from the list and click on the “Remove” button. Specific recipient – Enter specific phone numbers here. Separate multiple entries with a comma. Message – Specify the message body text here. Adding actions to an Action list is done from the Action list information view. To open this view, click on the name of an Action list from the Action list view. The Action list information view is displayed. In the upper section of the Action list information view, basic properties of the Action list is displayed, such as its name and description. In the section in the bottom, all actions that has been added to this action list are displayed. To add a new action to the Action list, click on the “Add action” command in the list. The new action page will appear. Select the desired action by clicking on it. The properties page for the select action will appear.